From climate change to population growth, global trends are constantly putting new pressures on established industries. Companies have to do more to stay both competitive and compliant in the face of changing commercial environments and increasing regulations. For Sabic, a global leader in chemicals, the best way to help its customers overcome these challenges is by working in ever close collaboration. 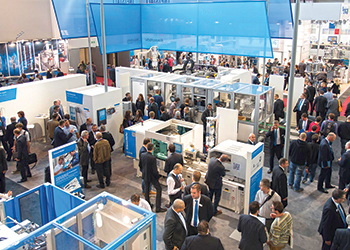 It is these relationships that Sabic celebrated at its stand at the Fakuma trade show in Friedrichshafen, Germany. The value of collaboration was highlighted through the award-winning film series, ‘Stories of Possible’, as well as a showcase of product applications. Potential and existing customers had the opportunity to see how close collaboration with the supplier can lead to innovation in sectors from automotive to packaging. The films illustrate how customer intimacy have led to overcome challenges in the development of renewable packaging; improvements in the reliability of automation; and increasing the range of material options available to industrial designers. Konrad Hellmann, Sabic’s country leader Germany, says: "A successful cooperation between supplier and customer is becoming more and more important with increasing economic, technological and environmental pressures. I am delighted that we at Sabic used Fakuma, an important trade show for our business, to highlight how some of our customer collaborations have helped meet new challenges. It is through these strong connections that we are encouraged to continue innovating, and to provide the right solutions to existing and potential customers." Sabic’s role in the development of the Simatic S7-1500 Automation Controller by Siemens for the Industrial Automation sector was portrayed in the Stories of Possible series. Matthew Thornton, Automation Consultant at Siemens, talked about the importance of long-term collaboration with value chain players like Sabic: "We believe that it is important to be working with a supplier that is in for the long haul. We work with Sabic to produce the materials that are required for the Simatic S7-1500 Automation Controller to work and run as efficiently as it did on day one, as it will in 15 years from now." Sabic also presented the fruit of their collaboration with the Norwegian liquid food packaging giant Elopak. The renewable polyethylene that Sabic is supplying to Elopak – Sabic LDPE nExCoat5 – directly addresses the plastic packaging industry’s growing demand for high performance extrusion coating films. Elopak is the first company to offer beverage cartons with second-generation renewable coating, which is not in competition with the food chain to the European market. The products are certified under the ISCC Plus certification scheme and are made to the same high specification as existing PE and PP products. Sabic cooperated with Škoda Auto and Magna Exteriors enabling them to develop the front bumper fascia found on Škoda Auto’s family of Fabia models. The fascia, a thinner and lighter version of its predecessor, was made with a new grade material, Sabic PP compound 8750. The new bumper design with use of this material resulted in a reduced part thickness of 2.5 mm and weight-out of approximately 12 per cent, while maintaining high impact, high stiffness and high flow. Škoda Auto also expects to benefit from a system cost reduction, lower cycle and lower reject times using the new Sabic solution. These examples highlight how Sabic is powering customer ambition to create value for the industries they serve. Sabic will further bring stories and exhibits from a range of market segments such as its products for metal replacement in water management and its performance enhancing solutions in the automotive industry.